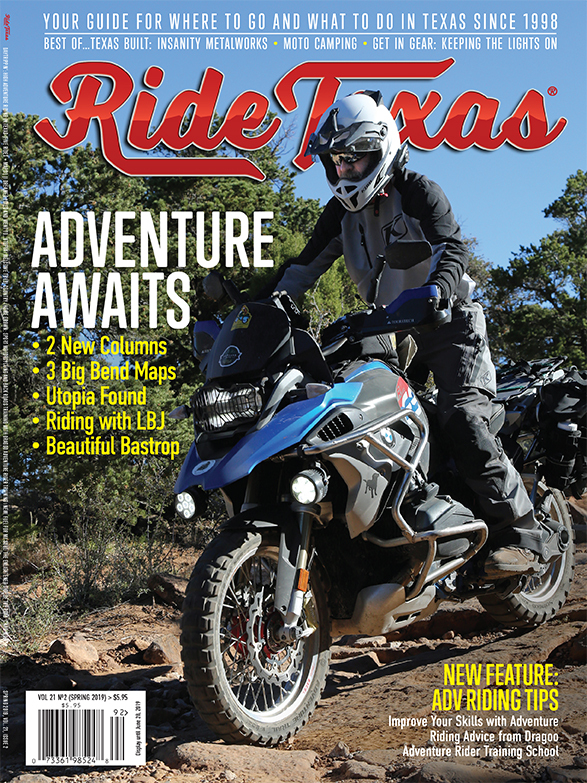 RIDE TEXAS® is a journalism award-winning travel magazine for motorcyclists. We publish work that emphasizes storytelling using compelling photography and engaging narrative. We strongly recommend you see and edition of RT for the type and style of articles we publish before submitting. We require first publication rights, so work that has been published elsewhere either in print or on-line cannot be considered for publication in RIDE TEXAS®. Our focus is regional and includes travel within Texas and into the neighboring states. Broadly speaking, articles should cover the background of the area and insights into the people and places encountered. Part of the submission package is the GO Planner information, which includes an area overview, and a route, as well as reference information. Your article should answer: What’s special about this place? Why should someone want to travel here? Think about the reader. We need a strong selection of photographs with subjects that show insight into the topic. RT wants to transport the reader to the place with vivid imagery. We need bikes and roads, but as important are images of interesting places, strange/unusual things, and people. We use both film and digital—350 dpi. More photos are always better. Please do not digitally manipulate the images prior to submission. RAW files preferred. If you don’t have any photographs to accompany your submission, there is no chance for publication. PHOTO ESSAYS: If your photographic work is outstanding, and has a story to tell, we’re interested. NOTE: We’re not interested in photographs of bikes parked by the side of the road. Submissions should include a short summary of your article—enough to explain your concept and provide an idea of your writing style. Your summary should illustrate your writing style and approach to the subject. You must include samples of photographs. If the photos aren’t taken yet, then include samples of your other photographic work. If you have been published elsewhere, please include 1-3 samples of your published work. Please, no calls to the office about submissions. Mail your proposal and samples to Editor, RIDE TEXAS® PO Box 90374 Austin, TX 78709-0374 If you mail your submission, please do not send it signature required. You may also use the contact form. It may take 1-12 months, but we will reply to all proposals that follow the submission procedure. Materials will not be returned, so please don’t mail your only copies. The editor will work with writer on edits but we reserve the right to edit as necessary without the writer’s input. 1st annual Fun Run benefiting “Parker County Relay for Life” Rings of Hope Team. Help us help cancer patients and support research for a cure for cancer to end these battles many of us have fought and many fighting today. It’s going to be a beautiful day for riding. Come out for a fun ride, fellowship with new friends and ride for a Cure.